Shreyas Talpade's film, co-starring the Deol brothers, never adds up to anything beyond a shrill or overdone caricature straight out of a dummy's guide in how to amuse, says Sukanya Verma. There's an episode of Friends where Joey Tribbiani is barred from entering his family's Thanksgiving celebration because he is the unwitting face of a sexually transmitted disease's awareness programme. As a minor joke in a 20-minute episode of a sitcom, it is fairly funny. Bhains ko ultiyan ho rahi hai. Bhains bhi aurat hai -- anyone? A remake of Poshter Boyz --Talpade's 2014 home production in Marathi, it aspires to do for vasectomy what Shubh Mangal Savdhan did for erectile dysfunction without any zing in its pen or the ingenuity of an ensemble cast. Nobody outside the Poster Boys troika adds up to anything beyond a shrill or overdone caricature straight out of a dummy's guide in how to amuse. 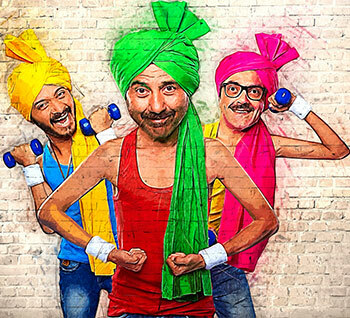 Daler Mehndi's energetic singing and Eli Avram's acrobatic thighs flag off the proceedings even as its three unsuspecting protagonists hailing from Jangheti village pose at a photo booth unprepared for the embarrassment to follow. Sunny Deol plays a retired armyman happy to shove a selfie stick in everyone's face. The sight of him pouting is the very definition of awkward but seeing him do a Marilyn Monroe pose goes right up there with the orangutans. Bobby Deol's mousy, scatter-brained schoolteacher goes for a Suri Uncle vibe, which hits the drollest notes in an otherwise clunky comedy. You'll almost forget he's the same guy who made tinted glasses fashionable as he picks up and puts back dropped bits of his painfully-cooked lunch box off the ground. The three men join forces after learning about their involuntary endorsement on a nasbandi poster as part of the government's public health service announcement. It's funny how much trouble they go through for the sake of a family that has no value for their word nor seems worthy. Also, Poster Boys never really establishes its insular milieu to convince us of the overblown nature of everyone's reaction to the poster -- as though they are Most Wanted criminals in the country. What it does is play for laughs by inserting innuendo, recycling gags, poking fun at physical handicaps, throwing in a neurotic Bharti Achrekar and hyper Ashwini Kalsekar for the sake of senseless clamour, asserting Sunny's superhuman vigour as he lifts and dangles men, breaks locks, yanks fences or needless butchery of the English language. 'Vasectomy -- kaun Tommy,' quizzes the government official. 'I telled you,' grumbles Bobby's cantankerous wife. And even Sunny, suddenly, decides to pronounce photo with a phhh instead of fo. It's only when the silliness is self-referential and parodying their body of work, there's something to chuckle about -- J P Dutta ka khud ka border hai? Or Bobby Deol's ringtone -- Soldier Soldier -- works both as a reminder and double entendre. Some unintended hilarity is triggered by Poster Boy's misplaced bouts of sentimentality when they liken their struggle to that of freedom fighters like Shaheed Bhagat Singh and Chandrashekhar Azad or maybe it's just a humourless nod to the Deols' 2002 ill-fated biopic on the same. Either way, the film's hastily served social cause around a ridiculously overdone climax refuses to be taken seriously. Especially when the slogan declares -- Na le panga. Andolan nanga. Poster Boys's school play enthusiasm never aims above a low IQ comedy expecting us to guffaw at the sight of Bobby, his wife and kids wearing the same set of bright yellow, Hello Kitty-print pyjama suits.